I never get enough sleep — part of the life of a performing musician, I suppose. I try, but it can be pretty tough when two to four nights a week are spent working from around 9 PM to 1 AM (after packing up and the drive home, that usually means about a 3:30 AM bedtime on gig nights!). I really should pay more attention to my sleep patterns, because living with diabetes means I am more likely to suffer from a number of sleep disorders. Today, I’m going to talk a little bit about one of the most common sleep conditions linked with diabetes — sleep apnea. Sleep apnea may be the most serious sleep disorder related to diabetes. In fact, among people with Type 2 diabetes, researchers have found a nearly 50/50 chance for sleep apnea! The reason for link is simply because diabetes, particularly Type 2, and sleep apnea share many of the same risk factors, most notably obesity and insulin resistance. Obstructive sleep apnea, or OSA, is most commonly caused when extra tissue inside the mouth and throat restricts airflow during sleep. This restricting of airflow can cause pauses in breathing overnight. These pauses are called “apneas,” and while they often don’t wake the person up completely, they do interrupt deep sleep, impairing the restorative work our body is trying to accomplish. Sleep apnea can lead to increased blood pressure, fatigue, lack of oxygen to the brain overnight, higher stress levels, and worsening blood sugar control. And it creates a vicious cycle, as many of these issues can then lead to even more severe weight gain and more severe sleep apnea! The impact on blood sugar control is particularly troubling. This happens because the chronic fatigue and shortness of breath creates a great deal of stress on the body, and stress has been shown to directly interfere with insulin’s functioning within the body. Over time, insulin resistance can develop or worsen, making blood sugars even harder to control. In order to determine whether you have sleep apnea, a sleep study is needed. This is a study in which you spend the night in a sleep lab, with monitors connected to measure bodily functions such as brain-wave activity, eye movement, and respiration. When an apnea occurs, your brain waves will shift into a state similar to when you wake up, even though you may not consciously wake up at all. How do you know if you might be a candidate for a sleep study? If you are a loud snorer, if you have high blood pressure, and if you are overweight, these may point to sleep apnea. Some other signs of this disorder include chronic feelings of fatigue during the day, even when you’ve gotten enough sleep; frequent headaches upon waking up in the morning — the headaches being the result of the lack of oxygen to the brain overnight; irritability; difficulty concentrating; and memory loss. Treatments for sleep apnea will vary depending on the severity. Weight loss is recommended for anyone suffering from sleep apnea and may be all that is needed in less severe cases. 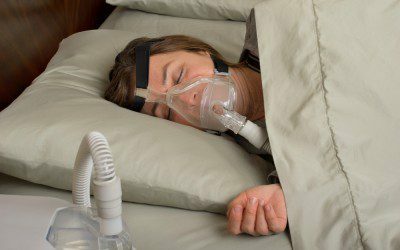 If you have a more severe case, you may need to use a CPAP (continuous positive air pressure) machine to assist in breathing overnight. You’ve probably seen these machines — they include a mask that you wear while sleeping, connected to a device that essentially keeps your airways open throughout the night to avoid those breathing pauses. In severe cases, surgery may be suggested. Certain procedures can be done that help enlarge the throat’s air passages, helping eliminate their susceptibility to collapsing overnight. While treatment may sound cumbersome (the masks “aren’t comfortable,” according to someone I know who uses one, but the impact on quality of life is “worth it”), it is very important to address this disorder if you have it. Left untreated, sleep apnea can negatively impact our ability to manage our blood sugar, raise blood pressure, and cause severe fatigue. All of this can combine to make successful management of diabetes VERY difficult, and we all know how frustrating it can be when our diabetes feels like it’s out of control!